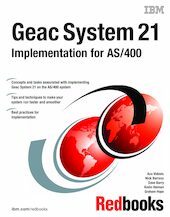 This IBM Redbooks publication offers a collection of knowledge gained from Geac consultants, customers, and AS/400 professionals who have experience with System 21 and the AS/400 system. This is a detailed guide that explains the concepts and specific tasks associated with implementation of System 21 on the AS/400 system. This book is designed to assist technical people among Geac System 21 customers, business partners, and service representatives. It targets these professionals who are directly involved with the implementation of a total business solution consisting of AS/400 hardware, OS/400, DB2 UDB for AS/400 database, Geac System 21 solutions, and supplemental solution products. This book is divided into four parts. Part 1 contains concepts and other basic knowledge that is necessary to understand the structure, features, and functions of System 21 and the AS/400 system. This part is especially helpful if you are a beginner in the AS/400-System 21 area or if you want to gain more insight into how System 21 works on the AS/400 system. Part 2 describes the implementation tasks and techniques necessary to install and properly set up System 21 on the AS/400 system. All System 21-AS/400 customers will benefit from the topics described in this part. Part 3 covers some advanced topics that will be of interest to those who want to optimize their System 21-AS/400 system to run smoother, faster, easier, and so on. Finally, you’ll find helpful complementary information in the appendices, which make up Part 4.